Spoiler deployed on the 992 looks pretty bad. Perhaps the designers are hinting "keep it stowed unless you need it." LOL! Easiest job in the world hahaha! I hate the door flap. No bueno. 911s look best with the classic pull handle. I'm sure it's some sort of stupid efficiency thing. Yes, I am not so sure about this spoiler. It's reminiscent of "The Flying Nun" to me, but there are lots of owners that love that big wing look. On the 911, the current Turbo wing looks good to me. I also liked the wing on my Cayman. My 911, not so much but I never have to look at it. I like it, esp. the front. The squared-off front lid with the 2 character creases...evokes the earliest 911s. Looks as though they have 2 cars running, one has dual exhaust tips and the other quad-tips. Correct on the deployable spoiler. Much wider. The chrome trim on the rears is blacked out with film. Just some weird disguising. Notice the FLUSH door handles?? The wider rear spoiler really kills the lines of the car when deployed - exposing the underlying metal, check out the rear 3/4 view - imho it looks awful and I would take a fixed duck any day. The "open trunk" look taken too far. 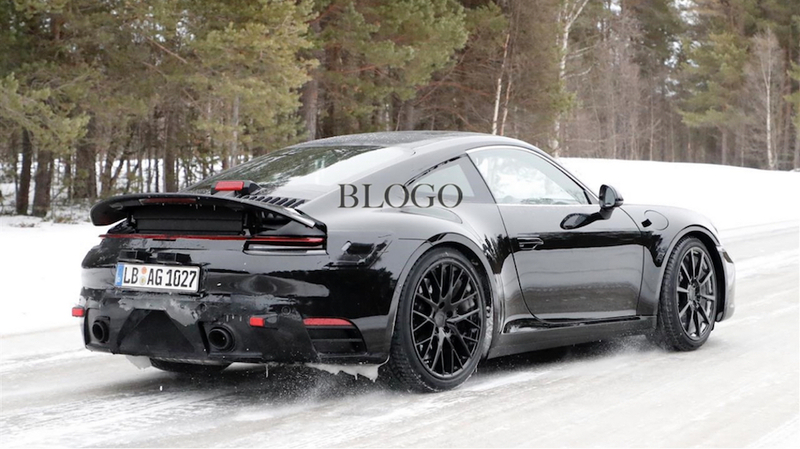 In addition you will have a very noticable gap between the rear quarter and the bumper cover as the wing extends down so low when not deployed...no good for those of us that like the cleaner look of the 991. Too many people on RL complained about not seeing the spoiler deploy and see what happened! You have yourselves to blame. The squared-off front lid with the 2 character creases evokes the earliest 911s..
Looks like 2 cars running-one with dual exhaust outlets, and the other with quad tips. Base and S ? Look closely, there is a 3rd brakelight incorporated in the rear edge of the spoiler. I think they're hiding it and using the tack on snorkel light just for disguise. Front wheel arch flares are very GT3 race car looking. The 992 will be slightly wider. I've read there will be a HYBRID OPTION for this generation. Expect the cabin to be slightly pushed forward a bit. When I say a bit, like an 1" or something. Same interior space though.